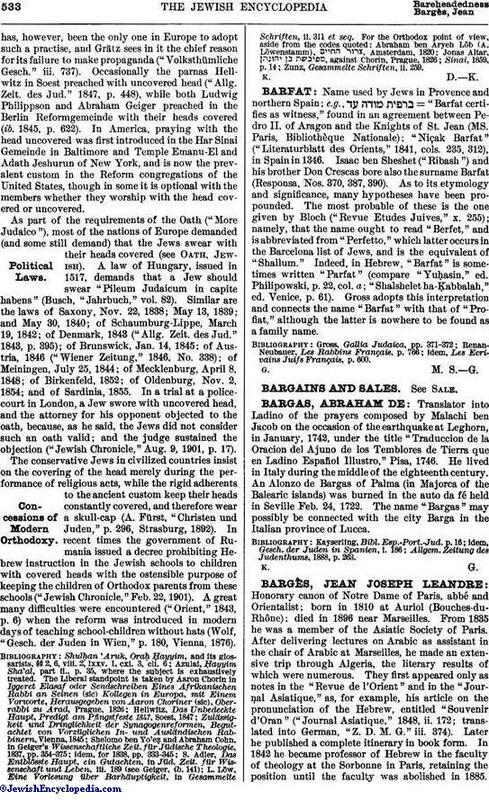 Name used by Jews in Provence and northern Spain; e.g., = "Barfat certifies as witness," found in an agreement between Pedro II. of Aragon and the Knights of St. Jean (MS. Paris, Bibliothèque Nationale); "Niçak Barfat" ("Literaturblatt des Orients," 1841, cols. 235, 312), in Spain in 1346. Isaac ben Sheshet ("Ribash") and his brother Don Crescas bore also the surname Barfat (Responsa, Nos. 370, 387, 390). As to its etymology and significance, many hypotheses have been propounded. The most probable of these is the one given by Bloch ("Revue Etudes Juives," x. 255); namely, that the name ought to read "Berfet," and is abbreviated from "Perfetto," which latter occurs in the Barcelona list of Jews, and is the equivalent of "Shallum." Indeed, in Hebrew, "Barfat"is sometimes written "Parfat" (compare "Yuḥasin," ed. Philipowski, p. 22, col. a; "Shalshelet ha-Ḳabbalah," ed. Venice, p. 61). Gross adopts this interpretation and connects the name "Barfat with that of "Profiat," although the latter is nowhere to be found as a family name. idem, Les Ecrivains Juifs Français, p. 600.